← It’s Here! Kromski Harp! Posted on September 11, 2008	by Linda S.
I finally got it warped. At the cost of probably 1000 yards of crochet thread…lol I had to cut all the previous thread off and start all over again using the warping peg instead of the warping board. The warping peg was so much easier that I probably will never try the board again. 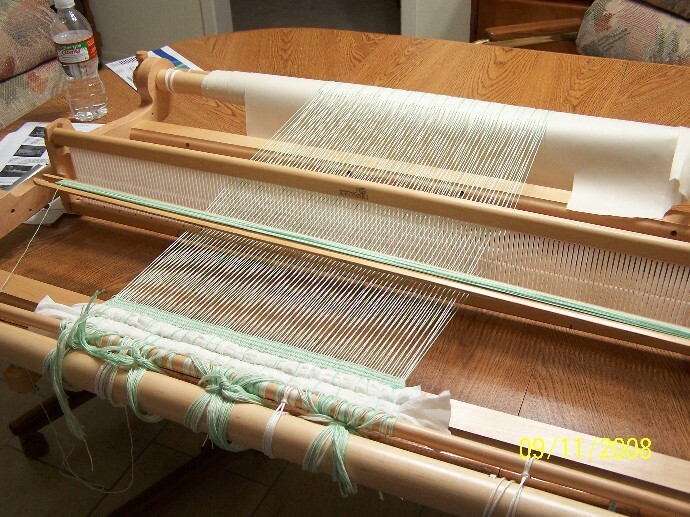 Using the warping board sort of reminds me of Andean plying when spinning…except that with Andean plying you don’t have to remember to keep everything exactly straight and find that top string. I’m finding myself to be a little “clunky” and uncoordinated using this, but I think that may be attributed to the fact that my table has thick edges that make it difficult to use the clamps properly. As a result the loom tries to jump every time I change the heddle position. My sweet DH says he will fix that for me today. This entry was posted in Handcraft, Handwork, Historical Textile, Spinning, Weaving. Bookmark the permalink. I’ve had the same problems, even without the warping board. I warped my loom with crochet thread and didn’t keep the tension even, what a MESS when I went to wind, but you learn with every try, it’s very addictive. I haven’t seen the Kromski in person, is the heddle openings wide enough for worsted weight yarn? I’ve given you the “I LOVE YOUR BLOG” award. please see my blog for details. I’m enjoying sharing your weaving adventure.